Spector: Videogames Still "Comic Books" and "Cartoons"
Warren Spector says videogames may continue to be disregarded by society if the industry doesn't get away from the current path it's on. Spector took the stage at GDC Europe this week to talk about his development philosophy, and of course his upcoming Wii game Epic Mickey. Ironically, Spector says that the industry needs to get away from ideas that began in comic books, and to realize that photorealism isn't achievable yet even in the games with the best graphics. Part of the reason that parts of society may see videogames as a hobby of nerds and geeks is because games are still following what Spector calls "male adolescent fantasies." Despite gaming making strides in the past decade, he says: "If we don't break out of big buff guys with swords and guys in tights and space marines in armor, we're going to get marginalised in the way comics have been in the United States. I hope we can break free of the content of comic books." Spector also feels that videogames aren't going to be able to compete with movies, and may want to take roads other than extremely realistic graphics to reach their audiences. He believes that "in some respects we're still making cartoons" and that studios would be better served trying to create their own visual styles rather than replicating every wrinkle and pore in a character's face. Even with games out there like Heavy Rain, Spector feels videogames "fall far far short of what people expect from a movie." Games are about the "player experience" to Spector, and his goal is to make "repeated action" fun. "Our job is to find ways to change the context around the repeated actions that we offer players, so you can do something and it's as much fun the thousandth time as the first time," he said. This is the core of a game to him, not killing dragons and powerful graphics. 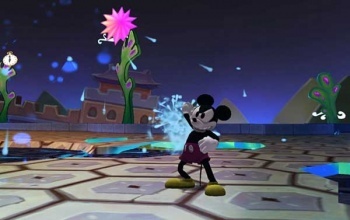 Spector's Epic Mickey is his shot at creating a different experience for gamers to enjoy in an iconic world. His comments hearken back to a time when everything was made out of pixels and bright colors, so a game's style was all it had. It wasn't about creating something that looked incredible, but about making something that was fun and unique. The problem is that buff guys with swords and space marines sell games really well, so I don't think Spector's hopes for the future are going to happen.